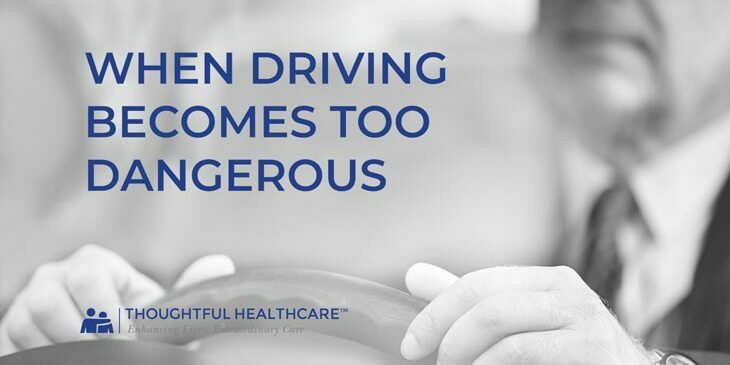 Ask Tim Tholen, CEO and Founder of Thoughtful Health Care and its affiliates in Kansas City about one of the most important questions he has fielded from clients over the years and he’ll mention the issue of driving. When– and how—should families take the keys away from a person who has been diagnosed with dementia? In the “When Driving Becomes Too Dangerous” video, Tim helps identify and address some of these issues to help family members take control of a potentially dangerous situation. Driving is a huge part of our lives in the Midwest. Some people grew up on farms where the tractor was practically a member of the family. In cities like Kansas City, being able to drive represents our independence and freedom. It’s how we get to work, how we see our family, do the things we need to do every day. For people with dementia, however, there is a time when driving has to stop. If the person with dementia admits that driving is nerve-wracking, it’s an opportunity to have the conversation about finding other solutions. Any talk about going “home” when the person lives at home is a precursor to wandering. If your loved one tries to find “home” outside of the home, it’s time to take the car keys to prevent them from driving to imaginary destinations. Conversations about going to work when work is long over. Again, this is a signal that the loved one will begin to wander. Take note if the loved one has trouble while driving. If she is drifting into other lanes, forgetting the destination etc… it may be time to stop. Many medications have warning labels that indicate that it’s time to let someone else take the wheel. Get ready to have the conversation. Focus on the safety of your loved one, and mention that other drivers and pedestrians may be at risk. Don’t expect this conversation to be easy; be firm, stick to your convictions. Any of the above indicators could signal the need for action. A person with dementia might agree that driving is no longer a good idea, but could forget the agreement. Some ways to insure that the car stays at home include: hiding the keys, changing the garage door code, or disconnecting the car battery. Regardless of how you decide proceed, taking the keys is an indicator that your loved one may need more care. Our professional caregivers at Kansas City Home Care are here to support your family in caring for a loved one at home. Please feel free to contact us for more information.